Thurmond "Tritium" Moore informed me that several FliteTest "residents" ("RAM", "Bricks", "Tritium", etc.) had discovered my CNC-driven foam cutter... I found their posts in the "$150 Laser Cutter" thread. After snooping around a bit more, it appears there is interest in an economical alternative to lasers, modified plotters, sewing machines, etc. for cutting foam sheets. 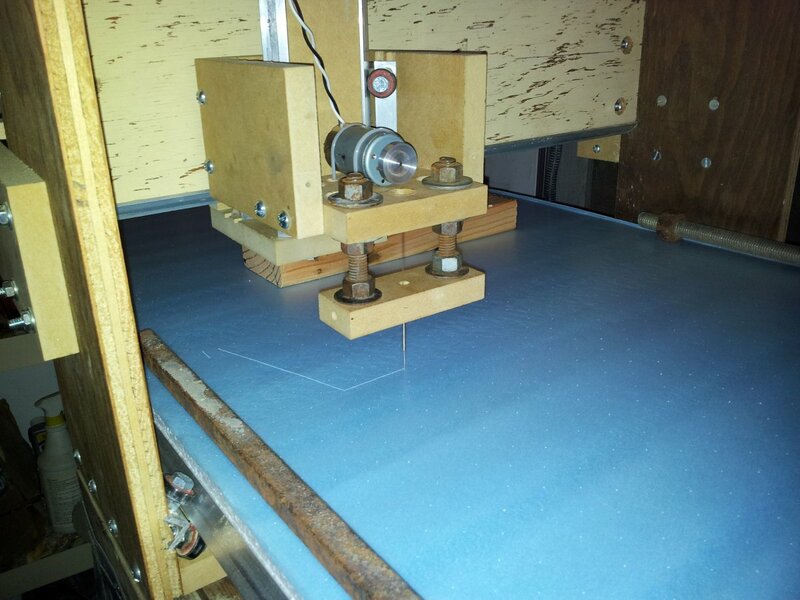 Basically my foam cutter is a very fast reciprocating needle -- like a sewing machine -- mounted on your CNC machine. 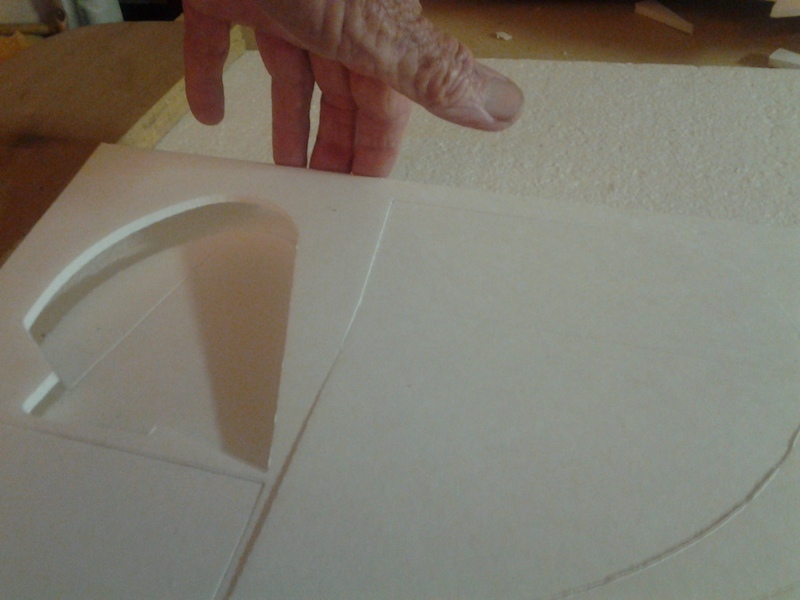 Set in a feed rate that yields 10-15 strokes/mm and you can cleanly cut DTF (paper on), blue-cor fanfold foam, etc. 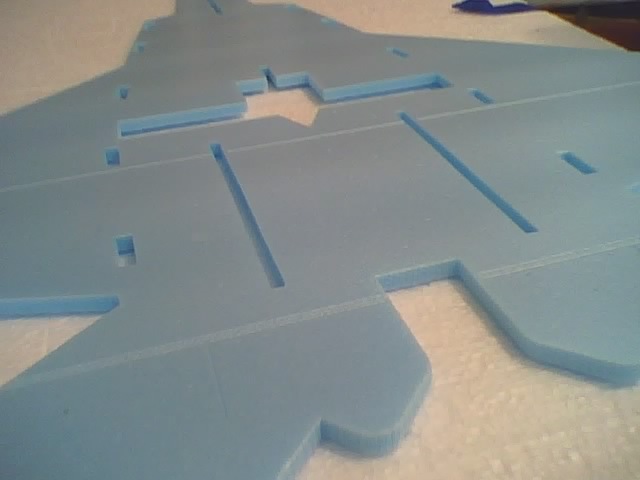 Pin a sheet of foam board onto the bed of your CNC, load in the plane's gcode, set the origin, and start the machine. 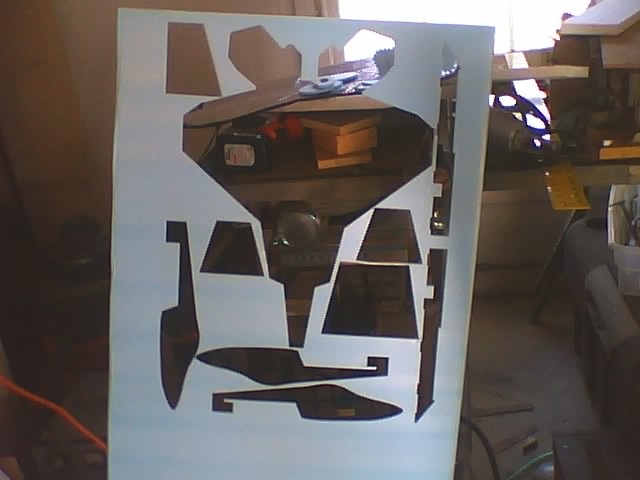 Twenty minutes or so later you have a sheet of parts that are accurately cut, easily punched out, and hot-glued together. Score cuts are no problem. Any chance you would consider an article describing your set up? Welcome to the forum! Thank you for your willingness to share your knowledge. I'm definitely interested in something like this, but I don't yet own a CNC machine. I'm up for the challenge of building one, but I have no idea where to even start with a project like this. Any advice you could provide would be greatly appreciated. By the way, I noticed the word "linux" as a part of your name. 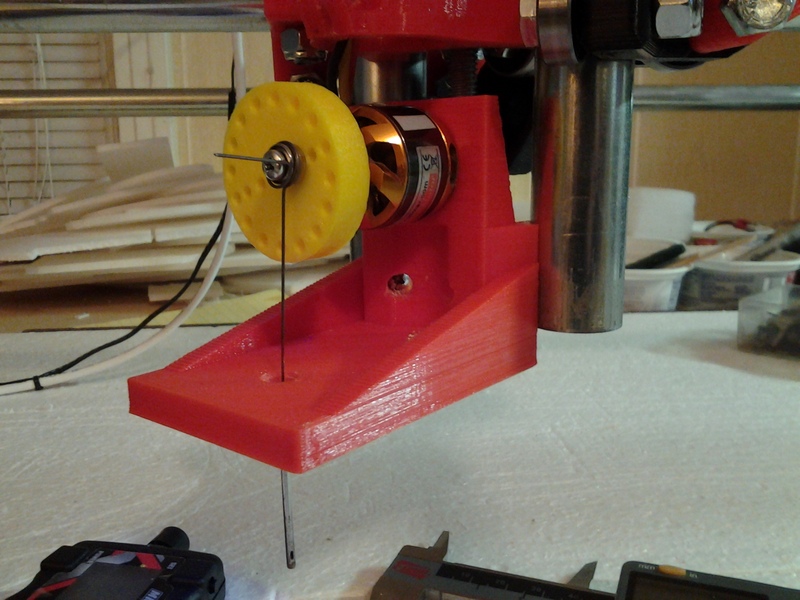 Are you using a Linux workstation to control your CNC? I ask because, Linux is my preferred OS. Thanks again. Awesome. Thanks for stopping by to share your idea. I have one question already. How do you deal with the timing of the needle? 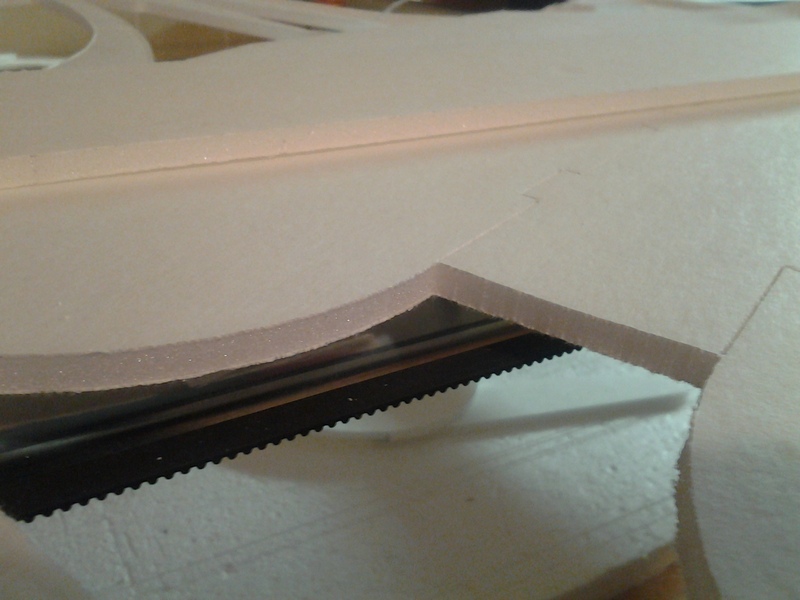 I've used a sewing machine to cut the foam board manually and it is very sensitive to needle breaks if you try to push the foam faster than the feed of the machine. Alright! 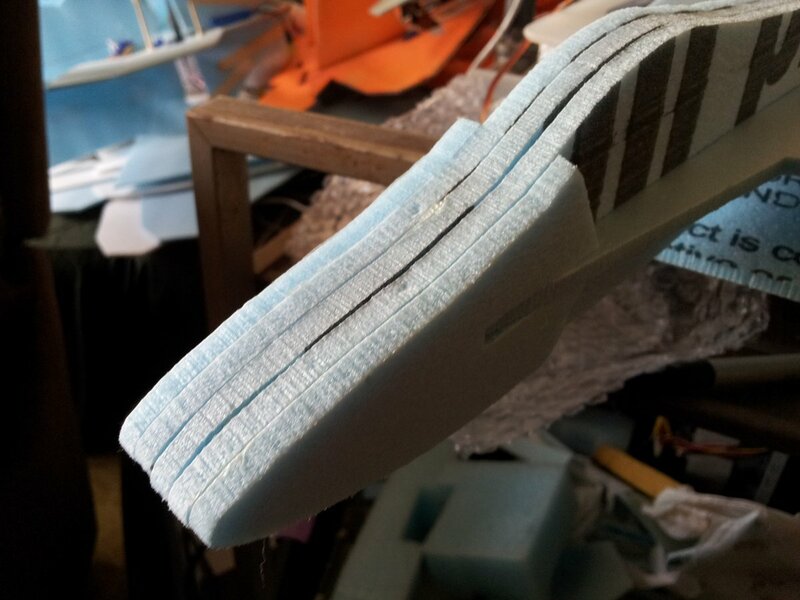 Several of you have already spoken up so here's the post with all the links I promised and a bit more information about both my foam cutter and the CNC machines I've used during its most recent development. 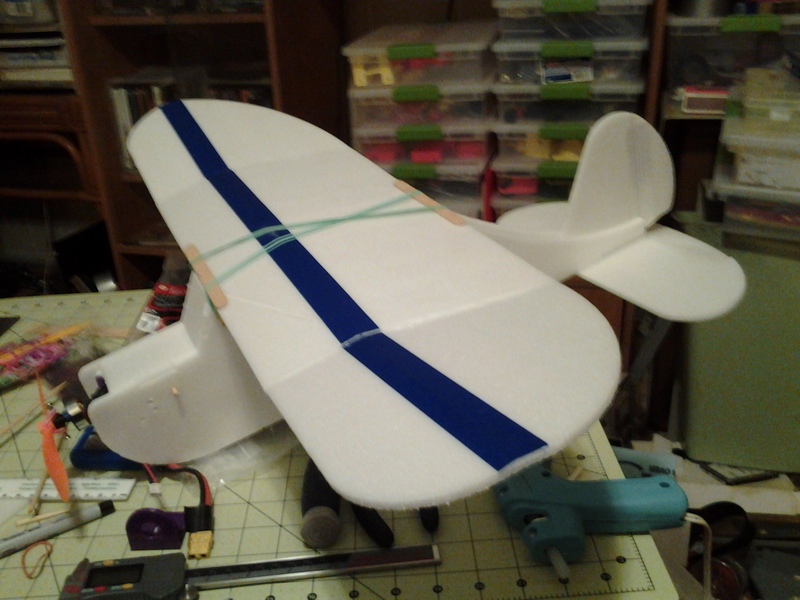 I've been using this method for several years now to machine-cut my planes out of fanfold foam insulation sheet and DollarTree foamboard. 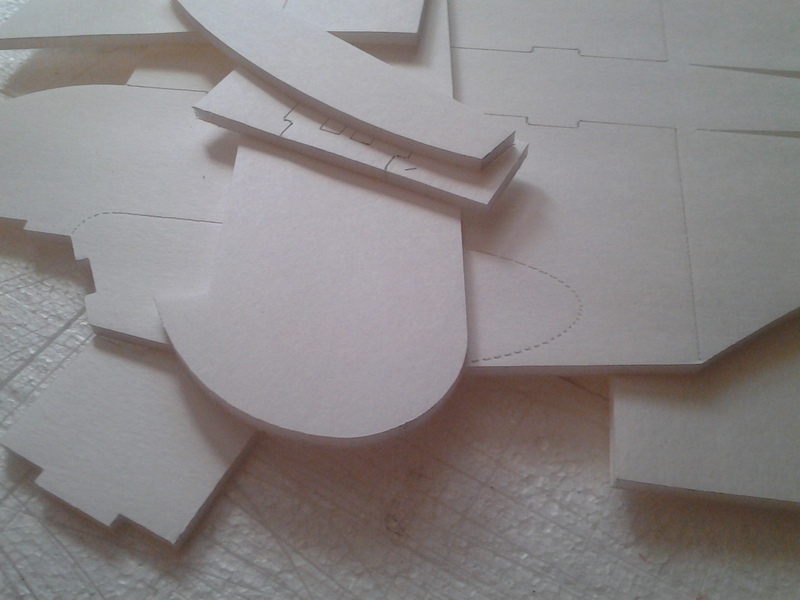 Never again will I hand-cut designs. 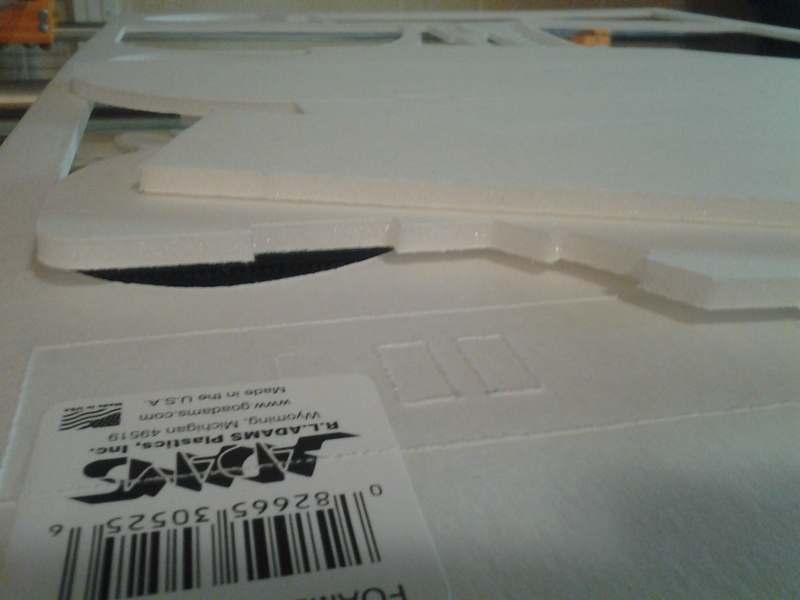 I know it appears a bit crude but I have cleanly cut "miles" of foam using this method with minimal fuss. Basically my foam cutter is a very fast reciprocating needle... like a sewing machine. 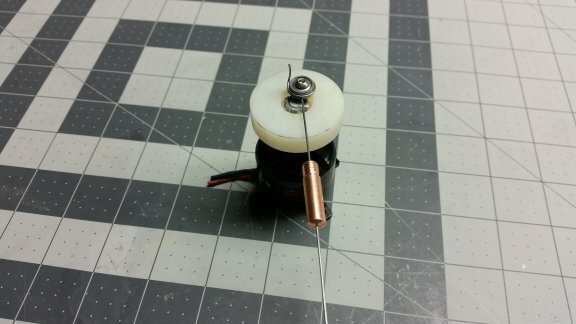 The needle is formed from a length of 0.025" music-wire and attached to a small ball-bearing mounted eccentrically on the flywheel. 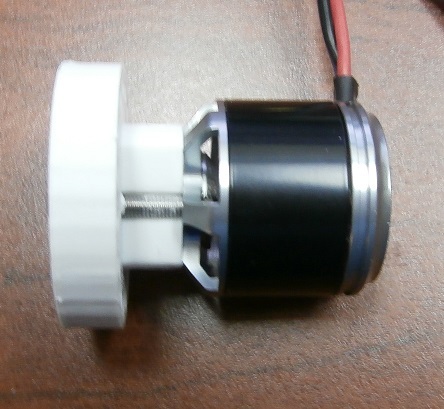 The flywheel is mounted on the shaft of a 2826/2822 brushless motor (with ESC and servo tester) and spun at 8000-10000 rpm, resulting in a stroke/perforation per revolution. 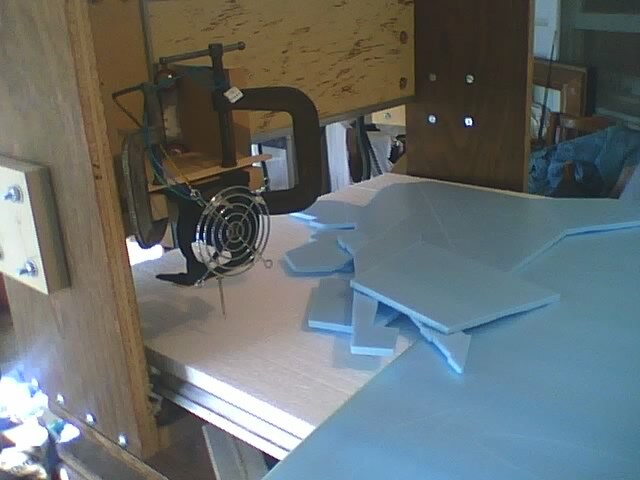 A feed rate of 600-1000 mm/min yields 10-15 strokes/mm and cleanly cuts DollarTree foam board (paper on), blue-cor fanfold foam, etc. In the past couple of months, I have built three of Ryan "Allted" Zellars' fantastic Mostly Printed CNC (MPCNC) machines for myself and a couple of friends and it is the perfect vehicle to mount a foam cutter and cut sheet foam materials (DTF, blue-cor FFF) accurately and cleanly. 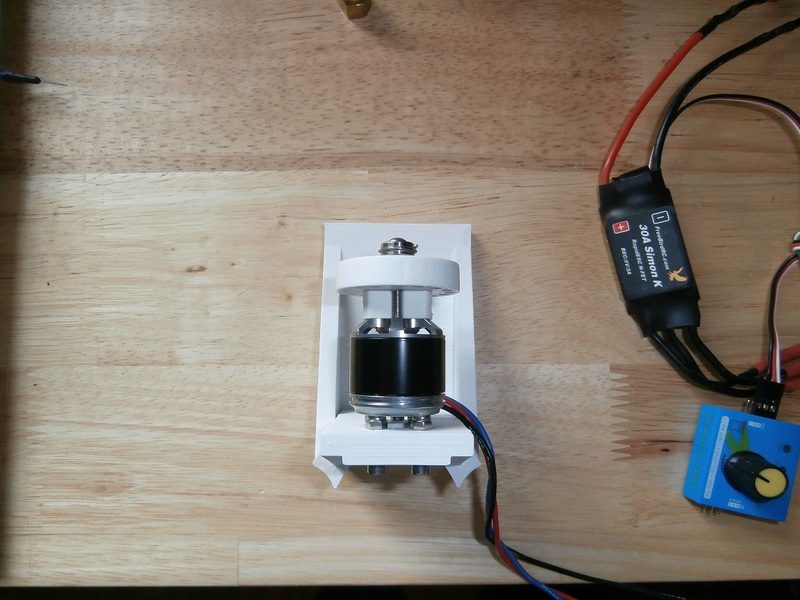 The foam cutter itself can be built and adapted to your CNC machine for less than $20 worth of parts (less if you're a scrounger). 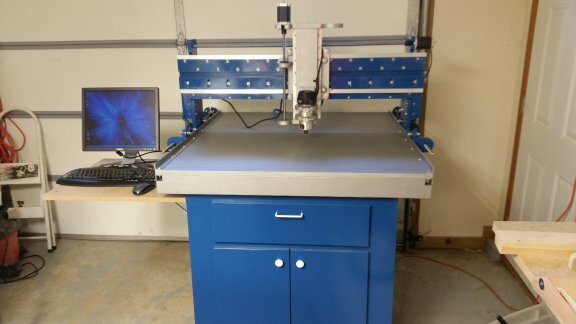 But if you also need a CNC machine -- and if you (or a friend) are "handy" and could tackle a large erector set project -- you can build a complete 48"x48" (or smaller/larger) MPCNC and foam cutter for less than $500 (<$300 if you can 3d print) and a weekend or two worth of time. 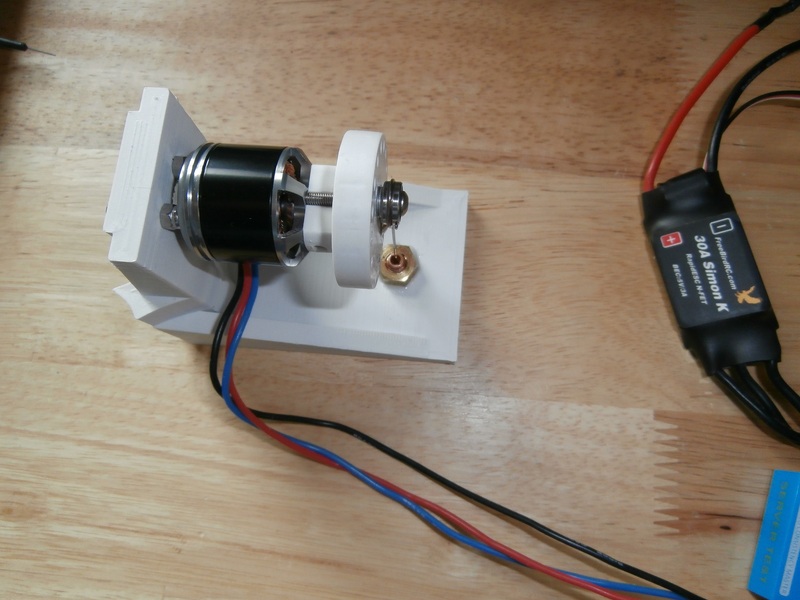 It is easily IMHO the most flexible and economical way to get into CNC at the current time -- even if you have to buy the hardware and plastic "bundles" from Ryan's website. I'm not at all affiliated with Ryan or MPCNC... I'm simply an old retired engineer who appreciates good engineering when he sees it. If you are interested in building one (or all) of these for yourself, please check out the links below. I'll continue to monitor this thread, answer questions, and further interact with folks here but rather than repeating everything I'm providing links to threads/sites that deal with the active design/development of this foam cutter and Mostly Printed CNC. Please check them out. Please feel free to join in the conversation and/or ask questions. Hey David, I just wanted to say thanks for taking the time and telling us about the details of your machine. Can you look at your first link? I'm getting an error for that. I think I've corrected the link in my previous post... please try again. 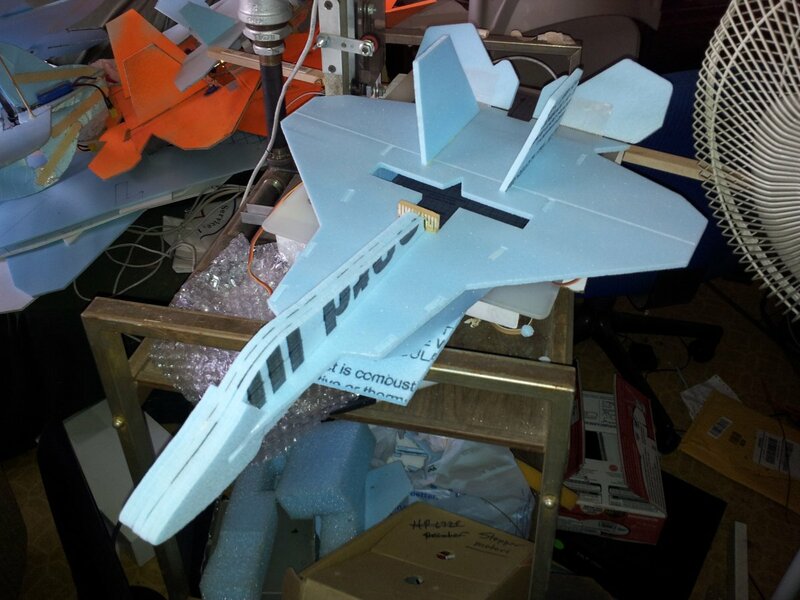 If for some reason it's still not working, please go to the RCPowers forum site and look for a thread "Mostly Printed CNC and cutting foam" in the Scratchbuilding forum. Funny you should mention it... take a look at posts #114 through #125 in that thread for a pictorial build log to see what's involved in building the MPCNC. I already had all the parts on hand... same as if you purchased the hardware and plastic "bundles" from the MPCNC website. I started assembly on Thursday evening and had a running MPCNC by early Saturday afternoon. 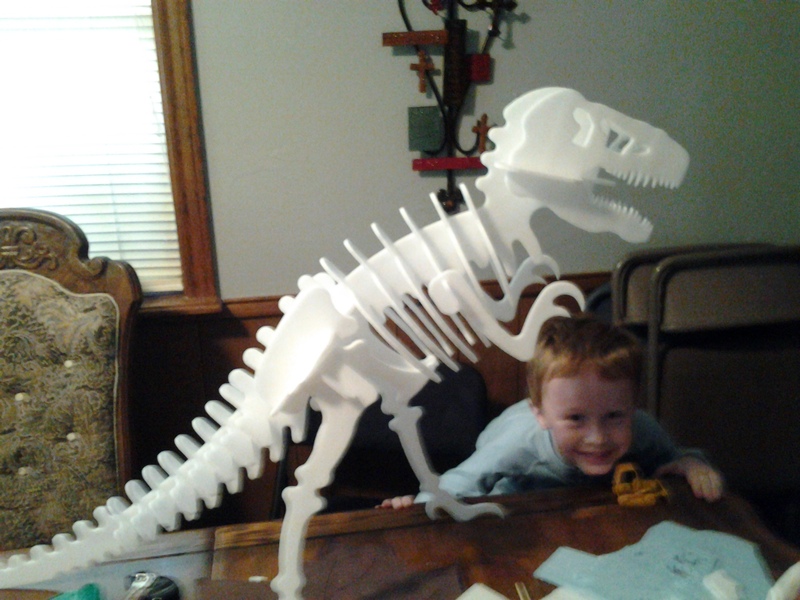 And since I had 3d-printed all the plastic parts myself, it cost less than $300 to build that machine. 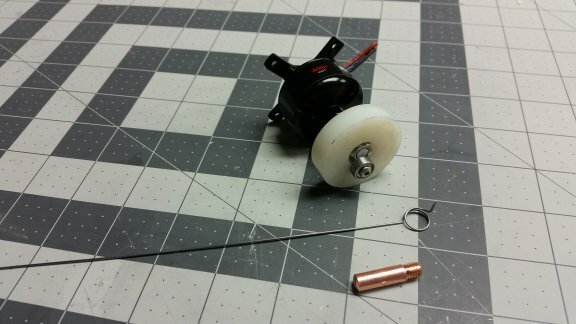 You might recognize an unmarked T-Motor ($3...thanks 3DR). 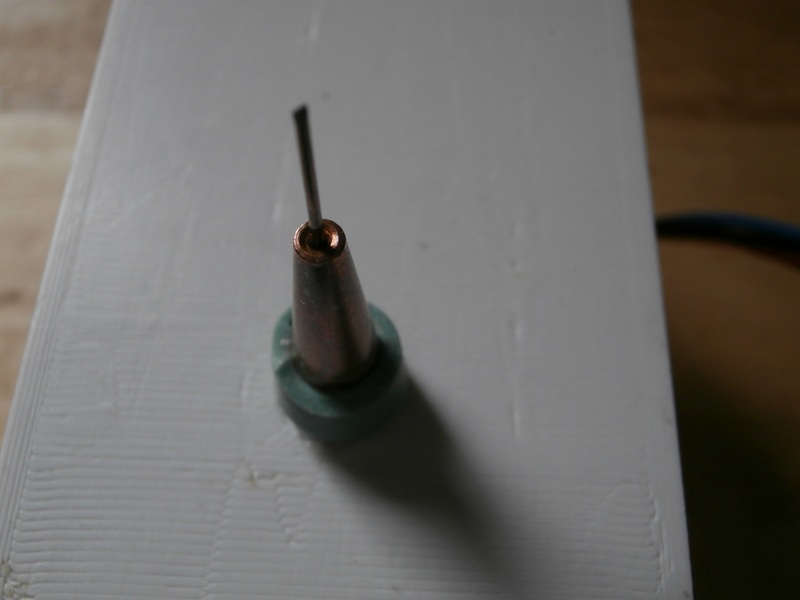 My needle is .030 and my guide is a Tweeco Tapered Mig Welding Gun Tip. I have been playing with mine by hand (think saber saw) since my CNC is in an unheated space and it's COLD! Hey David I worked for that same company (but in Lubbock) from 1979 to 1981. Met my wife there. Great find, Thurmond! This is fantastic, dkj4linux. Thank you for sharing your information! 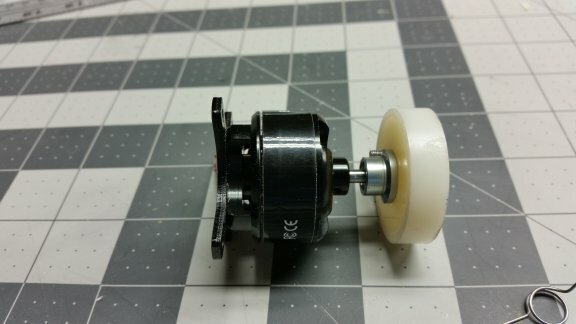 Now you need to get into Tinkercad and whip up a handle to attach to the mounting points and curl up over the top... you could probably even mount the ESC, the servo tester, and maybe a battery as well. 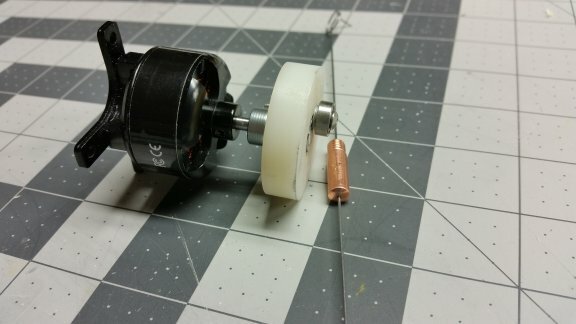 I'd really never thought about how usable the foam cutter might be as a hand-held tool but I can definitely see some potential... and it might really appeal to the RC folks here that don't have CNC machines. I just bought a 3d printer and have been looking at the Mostly Printed CNC. I figure i might make it a long term project as it will take a while to print all the parts out and start collecting the electronic parts a little at a time. I am wondering how complicated is the process of turning PDF plans into g-code to use on the cnc machine to cut out the parts? Thanks dkj4linux, for posting this! 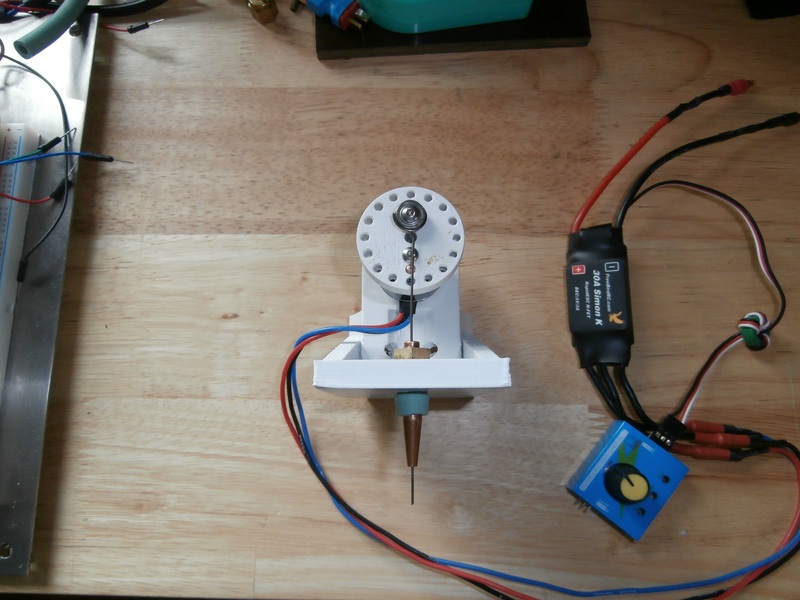 I can't wait to put together a needle cutter for my homebuilt cnc router. I just need a 3d printer for the housing and flywheel. Time to go shopping and see what I can find. Congrats on your 3d printer purchase... and your interest in the MPCNC. As I've said I have no affiliation with Allted or MPCNC but I have built 3 of them over the past couple of months so can give the benefit of direct experience with the machine. It is an incredibly flexible and economical machine and IMHO it's the easiest and cheapest way to get into this CNC stuff today. I built the first of the three MPCNC machines, sourcing all my own parts and printing all the plastic parts from the Thingiverse stl models. All went very well and I have a fully-functional machine. It now hangs on my wall... I had to make room for the others I had to build. When I added up all the costs, however, I found that purchasing the hardware "bundle" from the MPCNC website met and/or exceeded what I did sourcing them myself. The bundle includes EVERYTHING you need to build the machine but the plastic parts, the conduit, and a spindle/tool of some sort. The electronics -- Arduino MEGA and RAMPS boards/drivers -- are included and the Marlin firmware is already installed and configured for the machine. So convinced I couldn't do any better, I purchased the hardware bundles for machines #2 and #3. 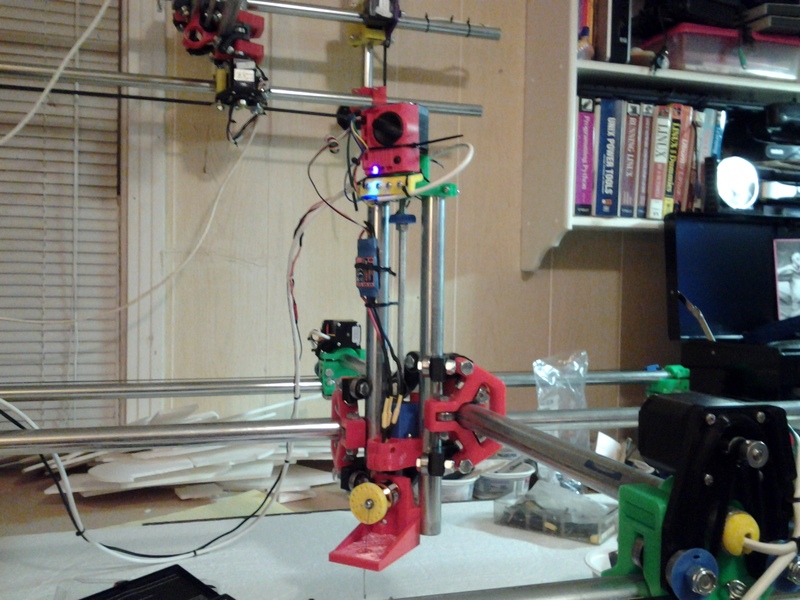 I also have two 3d printers... a NWReprap Prusa I2 built from a kit several years ago and a FolgerTech 2020 Prusa I3 I built from a kit about 6 months ago. Both are calibrated nicely and I kept them both busy printing parts for the other MPCNC's I knew I had to build. It takes about 1-1/2 spools (1 kg each) of filament per MPCNC machine... about $30 worth of plastic filament. 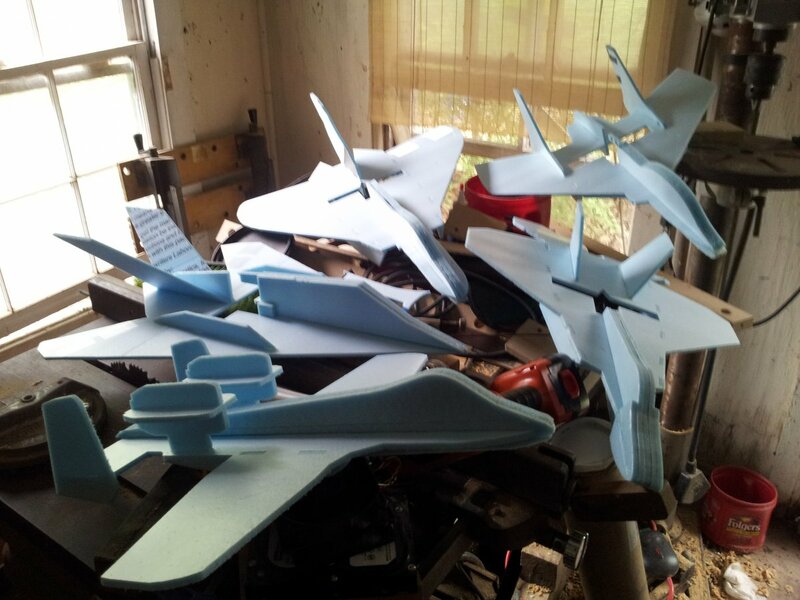 Machines #2 and #3 are now completed and both have been used during my recent foam cutter development efforts, documented here and on the other forums I've cited. All three machines have been built for less than $300 each. If you purchase both the hardware and plastics bundles from Allted, it's more like $450 per machine. Still a good deal IMO. BTW I did a pictorial build log of machine #3 -- assembled in about 1-1/2 days -- in posts #112 through #125 on the RCPowers thread (http://www.rcpowers.com/community/threads/mostly-printed-cnc-and-cutting-foam.18808/). 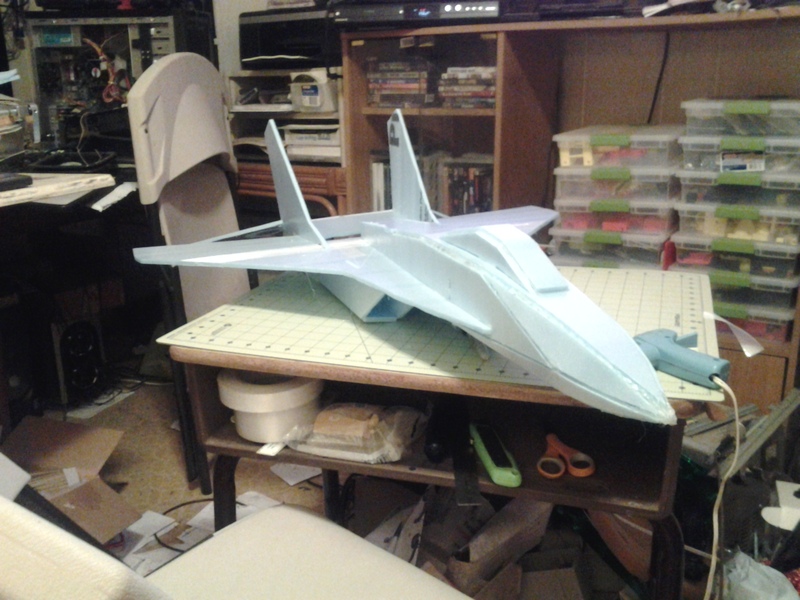 About the software... if you are talking about RC plane plans, I use "pstoedit" to convert a PDF into DXF format. I then import the DXF's into SketchUp, scale/edit/arrange all parts into material-sized sheets, and generate gcode for each sheet using the SketchUCAM plugins. There are ways to run these programs using both Windows and Linux... I prefer the latter. Hello, Mike. Thanks for your interest. PLEASE, please don't let lack of a 3d printer slow you down. My first versions were very simple and did a fine job for the time... the very first was a CPU fan out of a PC! 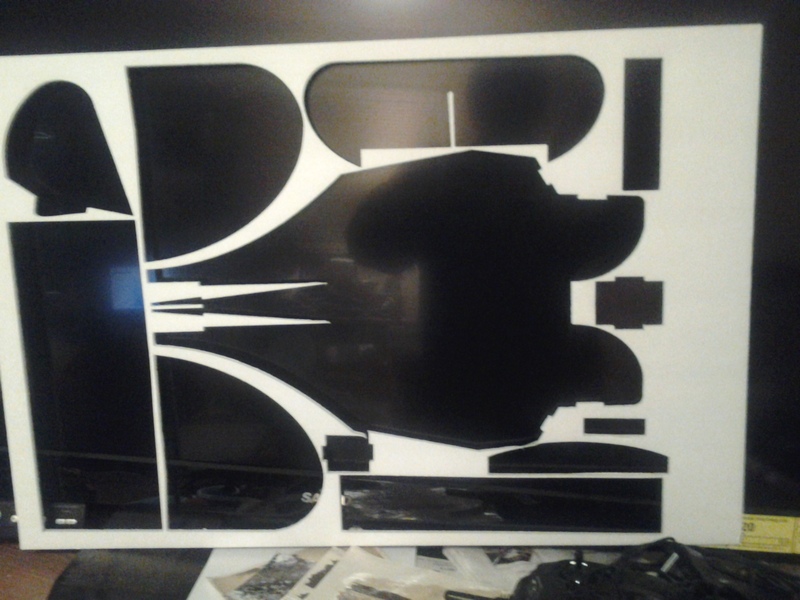 I cut many sheets with it and when it died, I used a DC motor out of an HP inkjet printer. Just like Thurmond I'm also on OpenBuilds, so I'm getting all the info I need over there . Main problem is that I'm having to build an Openbuilds C-bot first. 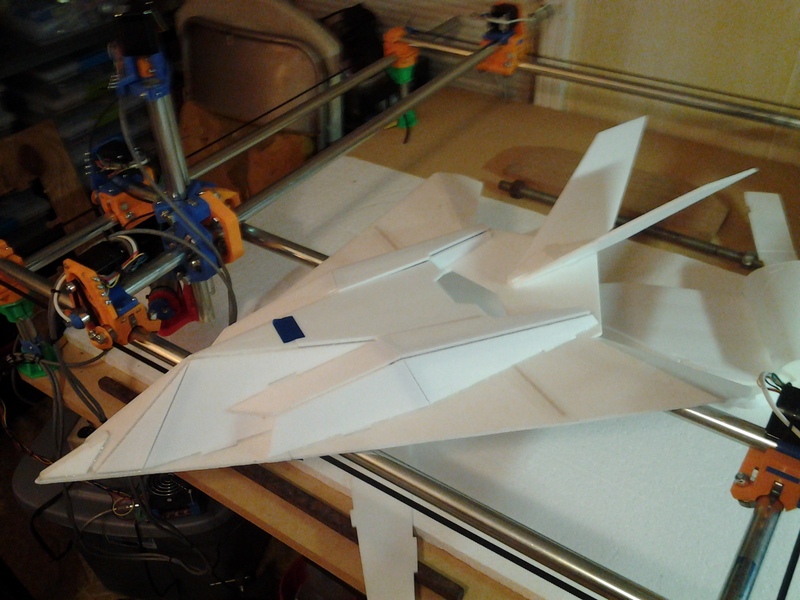 I love my 8x8x8cm Mini Fabrikator, but the size is quite limiting. Now that they are talking about a V2 of the C-bot I might jump at it. Also they've been talking about creating a new Phlatprinter with OpenBuilds parts. Having very limited space that'd be the perfect solution for me. But it looks like that might take some time still. Thanks for the response. I plan to buy the electronics bundle. I did some searching around and couldnt find all the parts for that cheap. I am going to print out the 3d parts myself which will probably take me a little while. I will check out pstoedit see what thats all about also. I've made a little progress on my needle cutter. 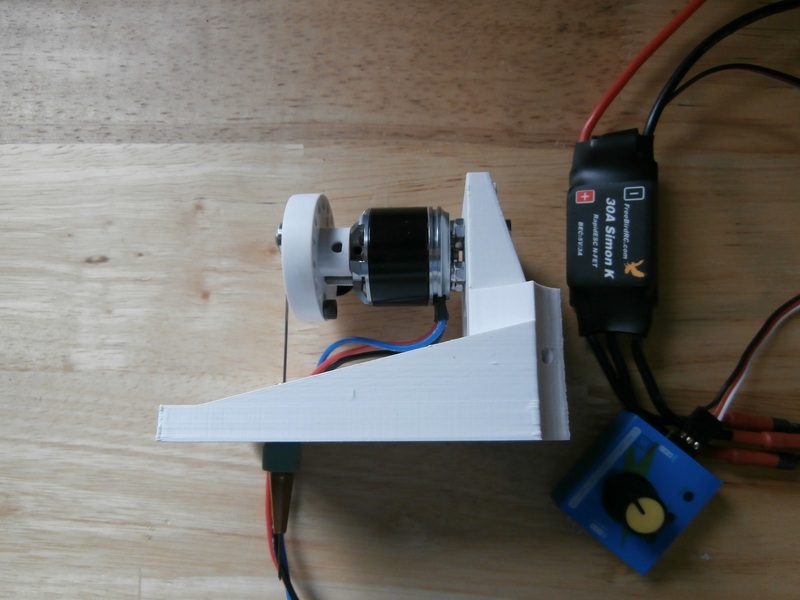 Here is a couple shots of my setup and my homebuilt CNC router I'll be attaching it to.